Personal recommendation is a good way to begin when searching for a meeting venue or convention center. Ask around to find out which center your company has used previously or get recommendations from associated companies. Another method is to use a convention or event organizer as they will usually have a wealth of information about the local venues, be able to advise on the best one to suit your requirements and they may even be able to negotiate discounts and special deals for you. Another good place to begin your search is the International Association of Conference Centers or the Tradeshow Handbook. 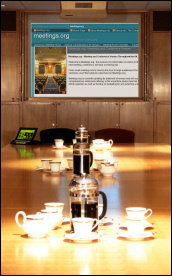 The Conferences & Meetings Directory also has a comprehensive list of venues as well as service providers across the USA.